Dracula is a lonely widower searching for a wife, but he doesn’t want anyone to know. So he hides in a corner of his hotel, pulls out his smartphone, and peruses the latest results from the “matchmaking monster” app. Perhaps romance is just a click away! Then his daughter, Mavis, finds him. Dracula successfully changes the subject, but she misinterprets his loneliness and sadness for stress. Perhaps, she suggests, he needs a vacation. “We need to all be together as a family like we used to,” she says. So Mavis takes charge, booking a surprise cruise for her father and everyone else, including Frankenstein and Murray the Mummy. Their destination: the Bermuda Triangle (of course). 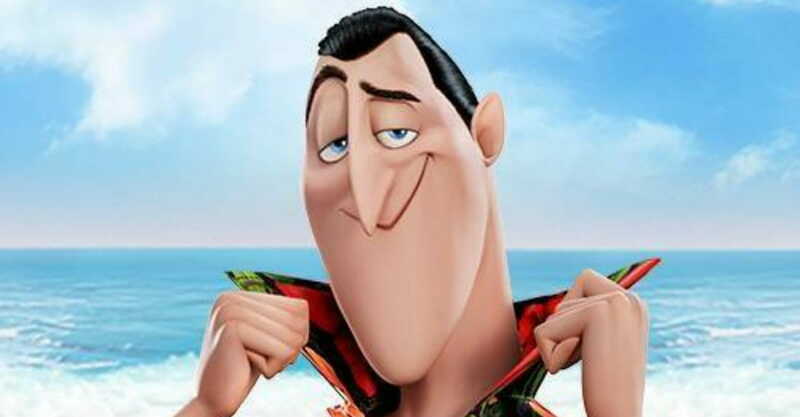 Hotel Transylvania 3: Summer Vacation (PG) opens this weekend, starring Adam Sandler as Dracula, Selena Gomez as Mavis, Kevin James as Frank (Frankenstein), Keegan-Michael Key as Murray, and David Spade as Griffin the invisible man. 1. It has a moderate amount of cartoon violence. If you’re OK with Looney Tunes, then you’ll be fine with Hotel Transylvania 3, which plays the violence for laughs. A man chases Dracula and tries to kill him with different wacky instruments, but misses each time. Later, the same thing happens on the cruise ship. The attempt to kill Dracula and the other monsters is a central plot. We see other types of violence, too. Coffee is intentionally spilled in Murray’s lap. Gremlins crash a plane into the ocean. Dracula is shot with arrows and survives. 2. It is occasionally weird and gross. One of the strangest characters is Abraham Van Helsing (Jim Gaffigan), a human who is more than 120 years old and who has survived until the present day thanks to a robotic body. His head rests atop this contraption, and one of his organs floats in a glowing jar. The cruise ship’s workers are fish with human feet. Frankenstein’s hand, arms and legs run away from his head on the beach. Strange, indeed. 3. It has only a bit of sensuality and contains no language. 4. It has a few other things you might want to know about. 5. It redefines what it means to be a monster. Historically, the characters of Dracula, Frankenstein and the Mummy have been dark, scary characters. Originating in the horror genre of novels and films, they’re the monsters you never want to meet. Some say they’re misunderstood, but I wouldn’t take my chances at night. In the Hotel Transylvania series, though, the monsters are the good guys. They’re altruistic, loving, and family-friendly. They’re not the monsters of R-rated and PG-13 films. Still, some parents remain uncomfortable with the movies, saying the history of the characters – and their traditional ties to Halloween and the dark underworld, for example – taint the movies, no matter the message. It’s a discussion worth having. 6. It includes great messages about family. They may be monsters, but their focus on family life is impressive. The film contains positive lessons about single parenting, growing up without a mom and dad, and remarriage. The back-and-forth between Dracula and Mavis – he wants another wife; she wants him to remain a widower – is particularly thought-provoking. The film also contains lessons about not judging people before you get to know them. Full disclosure: I’m not a fan of the Hotel Transylvania series, but I laughed out loud multiple times. Dracula’s quirkiness is similar to Gru in the Despicable Me films, which remain some of my favorite animated movies. NEXT: The Surprising Success — and Faith — of Won't You Be My Neighbor?